There is nothing like the sound of thundering hooves making the trek to Louisville for the first Saturday in May. I have been watching races, and waiting for the “big horse” to appear. I have a few that are top of the class right now, but it is still a little early to make up your mind. So, sit back and start getting serious, as the real runners are making their way into the starting gate. The forecast calls for rain Friday, and showers on Saturday morning. I would have to say the staff in Hallandale will have the track sealed and ready for the competitive card. A compact field of six go post-ward, and #3 Thunder Moccasin (7-5) looks to be a part of the controlling speed. This son of A.P Warrior can make the hook and not look back. A very nice win over Ender Knieval who came back to score after being second best to this guy. Been off for 49 days, and is 1/1 at GP. 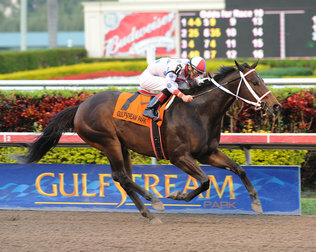 John Velasquez has the call for the red-hot Todd Pletcher barn (37%). Catch him if you can…. #4 Quick Wit (6-1) has the services of Ramon Dominguez for Dale Romans. 3rd off the layoff, and exits a nice maiden score over the GP oval. The pace should play well to his style. Another runner that deserves much respect is #6 Ever So Lucky (2-1) – Julien Leparoux and Jonathan Sheppard team up aboard this son of Indian Charlie. Cuts back to 7f after being a beaten favorite at Churchill in the Kentucky Jockey Club. Things may be coming up roses for the Sheppard barn, as he is sky high on his runner. Toss out the lackluster work, and you have a nice middle ground runner. Race #9 – 1 1/8 on the turf – Suwanee River Stakes (G3) – 4:17 p.m.
With the rain in the area, I am going to look for players who enjoy a track with a little cut to the ground. #2 Denomination (3-1) – Joe Bravo in the irons for trainer Christophe Clemente. Jersey Joe will always deliver a solid effort, and the barn knows how to get them ready. A daughter of Smart Strike who should enjoy softer footing. A beaten favorite last out, and the trainer wins 20% with turfers. #4 Heavenly Landing (4-1) – Corey Lanerie up for Eddie Kenneally. 1/1 at GP, and made a big move to win the Marshua’s River. She is 3/3 over the sod, and looks to better her record today. #8 Snow Top Mountain (5-1) – Jose Lezcano has the call for Tom Proctor. 1/1 ITM at Gulfstream Park, and enjoys softer turf. A closing effort last out ended up hanging a bit in the stretch. I see a much better effort, and Proctor may be one of the best kept secrets on the weeds. #3 Big Blue Kitten (12-1) – Julien Leparoux for Chad Brown. They are 3/3 ITM on the GP oval, and make a second off the layoff run. Mr. Brown wins 28% on this move, and he is 7/7 ITM at Gulfstream Park. This is a solid price for a Kitten’s Joy runner, and the team is as good they get. #1 Silver Medallion (5-1) – J.J Castellano in the irons for Todd Pletcher. 7/8 on the turf, and Pletcher is off and running with a great year so far. Closed like the wind last out, and has to bring his “A” game. By the way, J.J. is an 18% winning rider on the weeds. #5 Boisterous (3-1) – John Velasquez has the call for Shug McGaughey aboard this son of Distorted Humor. Cuts back in distance, and appears to be a very solid closer. Johnny V fits like a glove, and this runner looks to be a major player. As always, WinningPonies is ready with your selections. Not only the Florida card, but your favorite ovals wherever they run. Be sure to check in with us every Friday as we’ll be doing a weekend preview, and we’ll follow it up with a recap on Monday to keep you in the loop with Thoroughbred action. As always, may your winners be many, and your photos be few….Best of luck this weekend! I was reviewing your free picks, and not one of them were a winner. Oh , sorry, you had a $2.40 winner. If you can’t give me one winner using your methods, how can I expect to buy winning credits with such dismal past results?